Make a list and a schedule. Determine everything you want to make and when each item need to go into the oven or cook on the stove top. Print out recipes for everything you're going to cook. This will help keep you organized and you can make sure that you have all the ingredients you need. 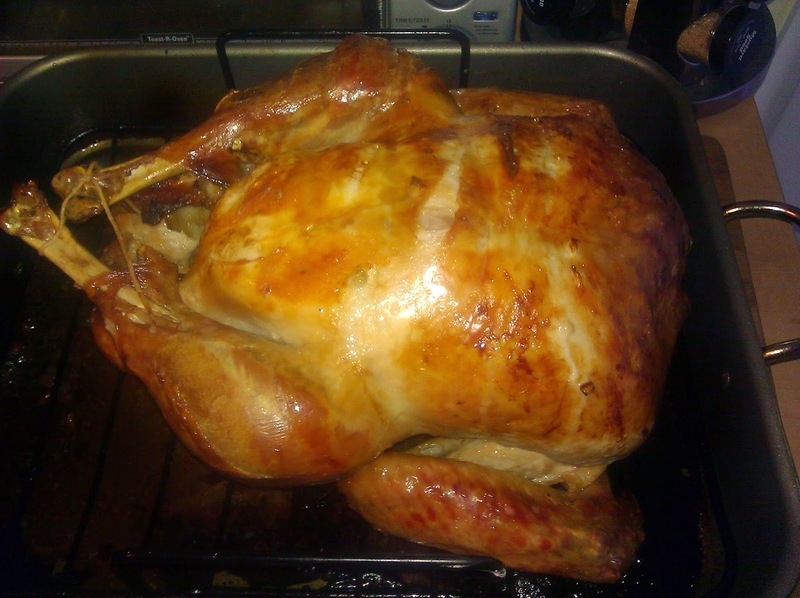 Make sure you move the turkey from the freezer and refrigerator a few days early so it can thaw. Thanksgiving dinner is not the time to experiment. Use recipes that you are familiar with and that you made in the past.This will help alleviate any Thanksgiving disasters. If guests want to help, let them.There is no reason why you need to make the entire meal yourselves. Let guests bring appetizers, wine, side dishes, or dessert. Don't feel like you need to make everything yourself. There's nothing wrong with buying a pre-made pie or salad in a bag. If you don't have one, buy a meat thermometer. The little pop-up timers in turkeys are incredibly inaccurate. Buy a carving board. A carving board is the one that has a channel around it to catch any juices. Also purchase an electric knife. It comes in very handy when it is time to carve turkey. Let the turkey rest for at least 30 min. before carving. Don't tent with foil or the skin will not remain as crisp. Below is a recipe for my grandmother's stuffing. All of the ingredients are pretty common, and they taste amazing together in this recipe. I am a firm believer in stuffing the turkey, but if you don't want to do that you can certainly bake this in a casserole – with some chicken or turkey stock added if needed to keep it moist. Preheat the oven to 250°F. Dice the bread into 1 inch cubes. Bake for 30 to 60 min. until the bread is dried, but not browned. Browned sausage in large skillet over medium-high heat. After fat renders, and onion. Cook for 5 to 8 min. until brown. And celery to skillet. Cook for 3 to 4 min. And bread cubes to pan and mix thoroughly. Cook for 3 to 5 min., then and 1 to 2 cups of chicken broth until bread i just moistened. Scraping pan to remove any browned bits. Cook 10 min. over low heat, stirring constantly.